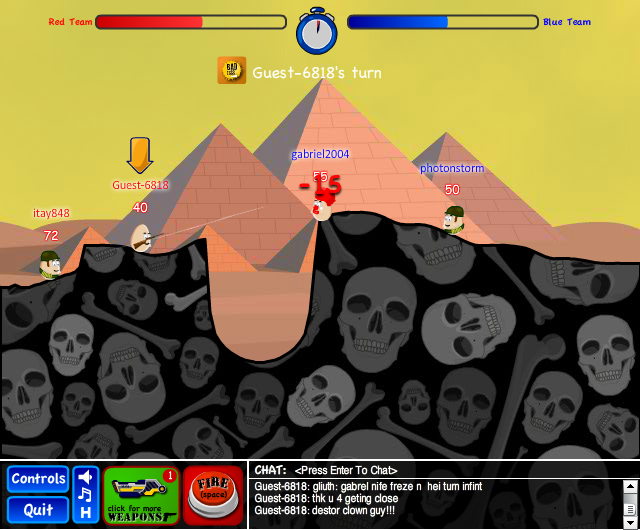 Bad Eggs Online is a new game from John and Rob Donkin. 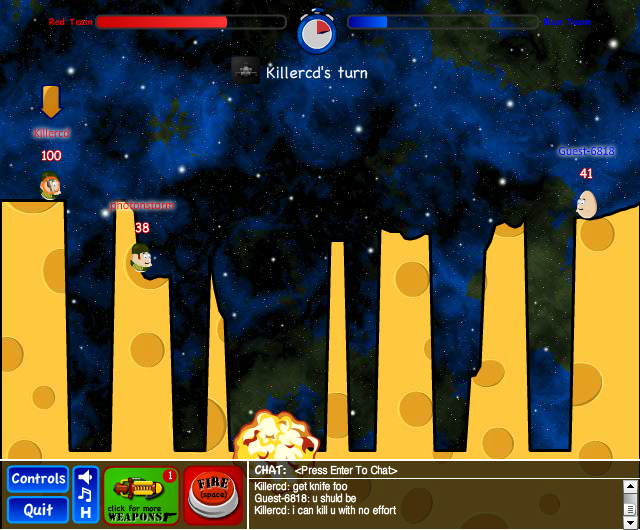 Think of it as a multi-player Worms clone. Only with eggs, an amazing range of weapons, and the kind of humour and sillyness that Worms should have evolved in to by now, but totally hasn’t. It takes advantage of the multi-player services provided by Player.IO and the registration and login process is seamless and cross-site. I registered when I tested the game on Newgrounds, but you can login anywhere – and now I mostly play on the official web site. There are various game modes including a classic 1-vs-1 duel right up to 6 players with 3 per team. Teams are split into Red and Blue and you never quite know who you’re going to fight against in a public match. You can make your own private battles too, and it gives you a code you can share via IM. There is much fun to be had playing with people you know, especially if they are in the same room – as Chris and I did in the Aardman office today, because there is a slight delay between your move and the other players witnessing it. So you can hear their evil cackle of glee several seconds in advance of watching your impending doom unfold on-screen. As with all Worms-like games you have to have good weapons, and this is where Bad Eggs really shines. From the standard rocket launcher and grenade, right up to the wild and wacky: A robot panda, a frying pan, a splurge gun, a “rain” bow (devastating at the right distance) and even a nuke which levels the entire landscape. You get a range of “fixed” weapons and some random weapons each turn. Weapons are available by leveling-up, by buying weapons packs or they come with special egg-shells (basically avatar costumes) – the ninja shell for example comes with a lethal shuriken. The costumes are perhaps a little less useful because the eggs are so tiny. It’s quite hard to appreciate the detail in them – and the detail is certainly there, from egg-stubble in the pirate outfit, to an awesome zombie shell complete with oozing exposed brain. The game is free to play, and you’ll get an immense amount of fun from just doing that. But I happily dropped a couple of dollars on it to buy some credits which I then spent on a couple of weapons packs. They are great fun because of the reaction from new players when you unleash something like the Horizontal Bomb, and the in-game chat lights up with “wtf was that? !” and “omg! epic!!”. Plus of course when aimed right, they’re lethal. The in-game chat is amusing, and you can of course mute annoying players. The ability to carry on chatting as a ghost is great, and I liked the way the chat log is remembered through the game lobby and level. The minimum spend is $1 which is enough for a few shells and as it’s via PayPal (or SuperRewards) you can trust it. It’s not perfect of course. For example I’d love to be able to jump, which would be especially handy when stuck on a weird outcrop of land. Or tunnel. And I’d like to see more penalty dished out to those wimps who quit mid-game, just as you’re about to hammer them into oblivion But on the whole there is an incredible amount of work gone into this. The range of costumes is fantastic, the weapons are inventive and fun, the standard levels are good and there’s a terrain editor when you want to spice it up a bit. All in all I strongly recommend investing some time in this game. Feel free to challenge me if you see me online! and don’t be put off by first-appearances. The relatively static visuals belie a well honed and rewarding play experience. Posted on October 18th 2011 at 12:09 am by Rich. View more posts in New Releases. Follow responses via the RSS 2.0 feed. Kids these days referring to scorched earth games as worms games!